Synaptic transmission and its plasticity are not occurring in empty space, obviously, but in an environment that contains neurons but also glial cells and extracellular matrix. How this interaction of neurons and an abundant subtype of glia (astrocytes) determines hippocampal network function is what our research primarily focuses on. The experimental techniques we are mainly using are electrophysiology in its various flavors, two-photon excitation fluorescence microscopy, analysis using custom written software (e.g. in Matlab) and numerical simulations (e.g. NEURON). See below for examples of typical experiments. Please also see our recent publications. Previous funding: NRW-Rückkehrerprogramm, Human Frontiers Science Programme, UCL Excellence Fellowship, DAAD. A typical example of an experiment studying how astrocytes support plasticity of synaptic transmission (picture). Synaptic transmission and its plasticity is monitored by stimulating axons while recording field potentials through an extracellular pipette (ep, schematic top left, fEPSP) immediately adjacent to an astrocytes patched in the whole-cell configuration (ip). A sample image (top right) of the astrocyte with its arborization, gap junction coupled neighbors and endfeet outlining a blood vessel (bv). The intracellular signaling of the astrocyte can be manipulated through compounds included in the intracellular solution to test how relevant a particular pathways is, in this case for long-term potentiation (LTP, also see full paper). Several current projects investigate the mechanisms that control the extracellular signalling of the NMDA receptor ligands glutamate, glycine and D-serine. In collaboration with Colin Jackson’s lab at the Australian National University we develop and apply novel neurotransmitter sensor. The picture illustrates one approach we have been using successfully. A novel sensor (CFP/YFP) contains a biotin tag that is linked to streptavidin. This mix is then injected into acute hippocampal slices, in which all membranes have been biotinylated previously (left schematic). 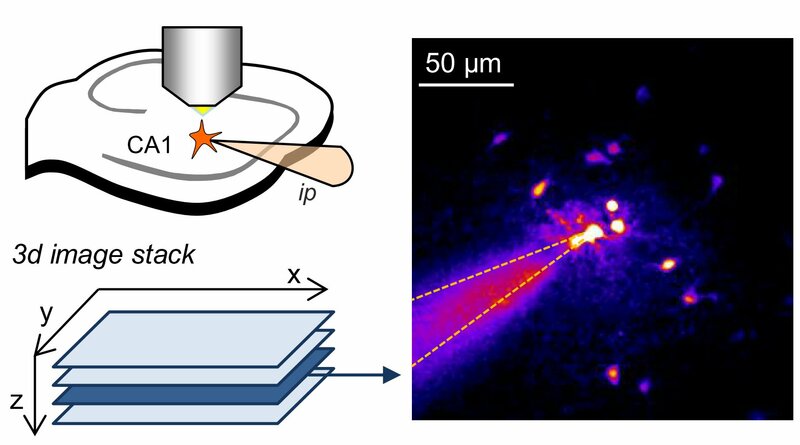 As a consequence, the sensor is immobilized int the extracellular space and can be visualized using two-photon excitation imaging (right panel, yellow sensor, superimposed on DIC image). We can test under which conditions and neuronal stimulation protocols an NMDAR ligand (here Glycine) is release. See here and here for full papers. Ca2+ and Na+ signaling can be studied at high temporal and spatial resolution using ion sensitive fluorescent dyes. 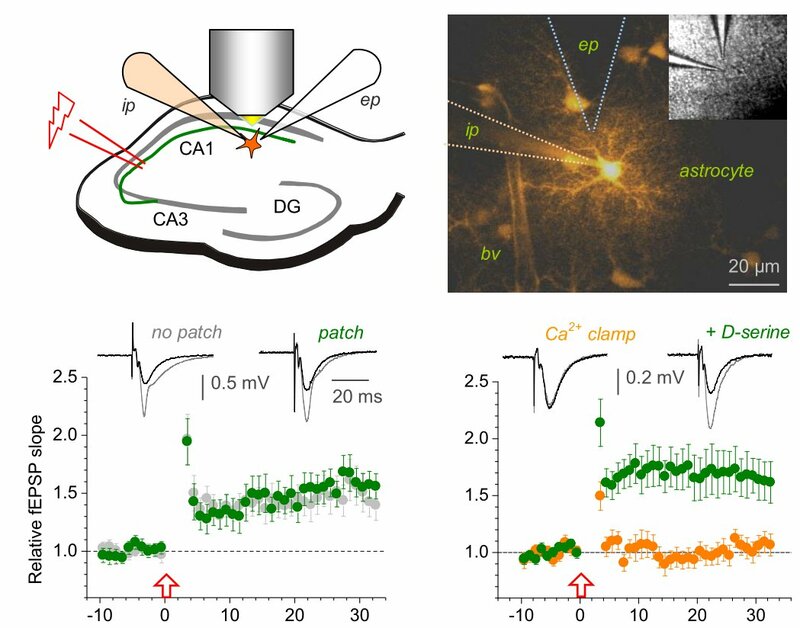 Shown is an example of Ca2+ imaging in single spines of a CA1 pyramidal cell. Cell are typically filled with a morphological tracer to visualize the morphology (e.g. Alexa Fluor 594). 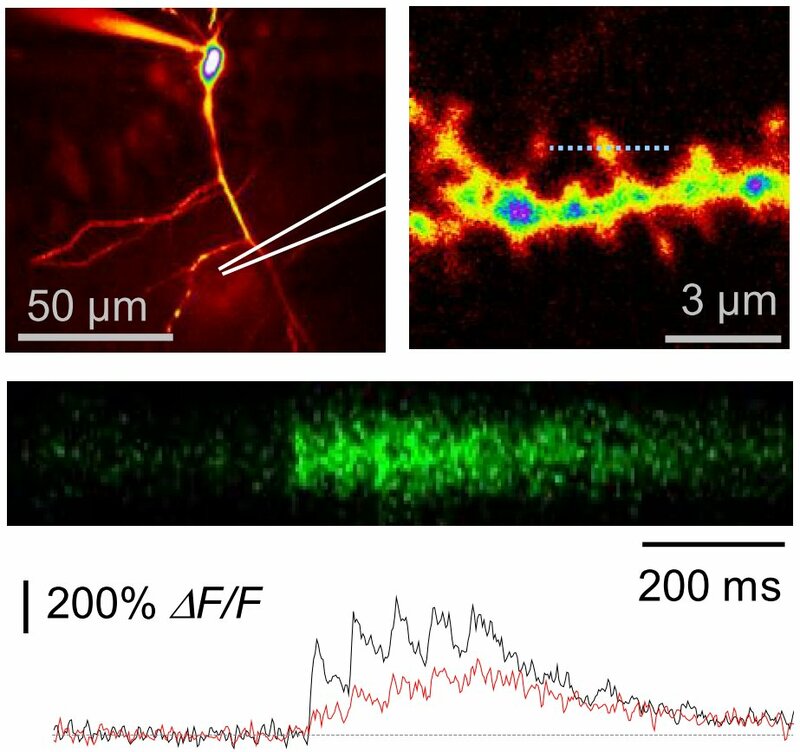 Two-photon excitation microscopy is then used to find spines on oblique dendrites (top left panel). Once a suitable spine is identified a line across that spine is continuously scanned at high frequency (top right panel, 500 Hz). The fluorescence of a Ca2+-sensitive dye (e.g. Fluo-4) is recorded while backpropagating action potentials are elicited by somatic depolarisation. The result are stepwise increases of Ca2+-dependent fluorescence (middle panel, lower panel for analysis). In this particular set of experiments we tested how disrupting the extracellular matrix affects neuronal Ca2+ signaling (also see full paper). We have recently upgraded one setup with a single photon detection system that enables us to measure fluorescence lifetimes (FLIM). Lifetime imaging has several advantages over intensity-based measurements (e.g. insensitivity to bleaching and changing dye concentrations). Astrocytes form networks by extensive gap junction coupling that are interwoven with neuronal networks. Diffusible signals like Ca2+ or cAMP and ions can pass between cells from cell to cell in astrocyte networks. This coupling is believed to be variable but at the same time critical for synapse and network function and also relevant for various diseases. The picture shows a sample experiment used to quantify the strength of gap junction coupling using whole-cell patch clamp of astrocytes (top left) and two-photon excitation imaging (right, also see full paper).